You need new flooring, or maybe you’re just ready for an upgrade. No matter what your reasoning is, the number one thing you need to determine moving forward is what kind of flooring to choose for your project. Here at Gateway Design and Home, we offer a lot of options to choose from, so we can find a personalized flooring solution to meet your needs. A lot goes into the decision of new flooring, from budget to comfort to installation requirements. To get you started, we’ve outlined a few of the most important factors you should consider before committing to new flooring. Take a few notes on your hopes and expectations for your project, and then stop into the Gateway Home and Design Loveland showroom for a one-on-one consultation with one of our specialists! One of the first things you need to tackle when deciding on new flooring for your home is choosing the style you want. Here at Gateway Design and Home, we want to make sure that you find flooring you love, which is why we offer one-on-one consultations with our specialists to help you make the best possible decision. Before you visit our Loveland showroom, however, there are a few things you can consider on your own so you can go into your consultation with a few ideas and make the process of choosing new flooring that much faster and easier! You probably already have an idea of the kind of floors you want, whether you are remodeling your house or building your dream home. Think of the color, texture, and pattern that will best match the look of the room. For a more modern style, for example, you may want to consider a unique print for laminate flooring, like stone. If you want a classic, rustic feel, then the high price and involved installation process may be worth the look of solid hardwood floors. Whatever you are looking for, the experts at Gateway Design and Home will work hard to find a style of flooring that matches your budget and your needs. Just take a few notes and we can use your ideas as a starting point! Aside from considering the look and feel of your future floors, you also want to consider what kind of flooring best fits you and your family. You want something that will look good for years to come, and if you have rambunctious kids and pets running around the house, you may want to consider a different kind of flooring than what empty nesters might choose for their remodeling project. Keep reading to learn our recommendations for those who prioritize durability and longevity! When shopping for new floors, we encourage you to keep an open mind! You may have your heart set on solid hardwood floors, but if it’s a strain on your wallet, we can help you find a flooring that almost exactly replicates the look and feel of hardwood without the high price tag. Flooring innovations have made leaps and bounds in recent years, and now the possibilities are almost endless. Engineered wood floors give you a layer of hardwood with a more durable core for better water resistance. Laminate floors can be printed with a wood pattern – or stone, or whatever else you choose – for a durable, budget-friendly solution that is almost indistinguishable from the real thing. The flooring specialists at Gateway Design and Home work hard to help you discover a material that meets all your needs, and it might be something you never expected! When you invest in new floors, you want them to look great for years to come. There are a lot of factors that affect a floor’s durability and lasting aesthetic value, and if you plan ahead, you can make sure that you give your flooring the right conditions to last. Here are a few things to consider when planning for a beautiful, long-lasting floor. The beauty and longevity of your flooring depends partly on how much time and effort you’re willing to put into its maintenance. Like any other aspect of your home, your flooring will require some upkeep to look its best, but different materials have different maintenance needs, and you can find one that fits your lifestyle. Vinyl flooring is likely the easiest type of flooring to care for, with laminate as a close second. They are durable – both water- and scratch-resistant – and cleaning is simple. Solid hardwood floors, on the other hand, need more careful care. Hardwood is a long-term investment, and if you are willing to be cautious about mopping and vacuuming, then you can help it last for decades. Another factor you need to consider when looking for new floors is the moisture levels of the area where you’re planning installation. Splash zones with high humidity, like bathrooms, means you should choose vinyl or tile for best results. Medium levels of moisture can facilitate water-resistant materials like engineered wood or laminate. In rooms with low levels of moisture, the world is your oyster, and you can consider more vulnerable materials like hardwood. For floors that look like-new for years, you also need to think about how much traffic the area experiences, and what kind of use it will see. High traffic areas, like the entryway of your home, will need a flooring material with high wear resistance. Carpet can get dirty and worn down, and hardwood can be easily scratched, although solid hardwood can be sanded several times throughout its life to erase damage. In comparison, tile and laminate are both very durable materials, but that also means that they are less comfortable to stand on for long periods of time. Note what kind of wear and tear your new floors may expect so you can discuss it during your personalized Gateway Design and Home consultation, and keep reading for our recommendations on choosing the right flooring types for comfort. With the right planning and consideration, you can help your flooring last by choosing the right material for the job. Gateway Design and Home’s specialists can help you find a durable, low-maintenance flooring material for high-moisture areas in your home, or guide you to a long-term investment like hardwood floors for rooms with beauty and comfort that you can enjoy for the lifetime of your home with the right cleaning and maintenance practices. As long as you understand the needs of your home, we can help you find the perfect flooring solution! Stop in to our Loveland showroom today to get started. 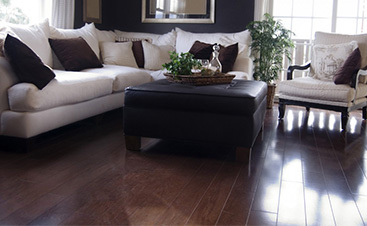 Naturally, one of the most important factors to consider when choosing new flooring is comfort. There is often a balance to be found between durability and softness or bounce. The specialists at Gateway Design and Home are here to help you find that balance! Here are a few things to consider when deciding how to prioritize comfort. If you spend a lot of time in a specific room, especially on your feet, then you may want to put comfort on your list of “needs” rather than “wants.” This is one reason why carpet is such a popular choice for living rooms and bedrooms — it’s hard to say no to plush fabric, especially on chilly mornings. The kitchen is another room where many people spend a lot of time, and while materials like tile are durable and easy to clean, they can be hard on your body because there is little to no give. You can use rugs or anti-fatigue mats to ease the strain, or you can choose a more comfortable flooring material from the start. Laminate is a good option, because it is installed with a foam underlayment for a little bit of bounce and a softer foot fall. For families with young kids, you want to choose your new floors with trips and falls in mind. You no doubt are looking for highly durable materials that can withstand spills, dents, and other consequences of the chaos that comes with kids, but their comfort should also be a consideration. Aside from carpet and laminate, solid hardwood floors are also more forgiving than other materials, and may help you avoid a few more incidents of bruises and tears. Whether or not you spend a lot of time in a certain room, or you have kids to worry about or don’t, the feel of your flooring can still have an impact. More comfortable floors are simply more welcoming. Solid hardwood floors at the entryway of your home, for example, guide your guests inside with a soft look and feel. While tile holds up well under muddy boots and your pet’s scrabbling feet, the hard texture has a much different effect that you may want to avoid. You want your new floors to look good and feel good. Let a Gateway Design and Home specialist know if comfort is a priority for your project, and we’ll help you narrow down your choices with that in mind. With the wide variety of flooring options in our Loveland showroom, we are confident that we’ll find a solution that will meet all of your needs. Come see for yourself and stop in today for a one-on-one consultation! The biggest commitment of new flooring? Finally installing it. That’s why it’s so important to think ahead to the installation process when you’re choosing what type of flooring you’re going to use in your next project. The most important factors of installation to think about are the cost and whether you want to leave it to the professionals or do it yourself, which, of course, go hand in hand. As we discussed in our page on budgeting for flooring, a DIY installation can save you money, but it can cost you in time and effort. If you botch the installation job, it can also cost you more in the long term. Some flooring types are more beginner-friendly than others when it comes to installation, and so we’ve put together a quick guide on what you could feasibly turn into a DIY project, and what kinds of flooring should be left to the professionals. Unlike solid hardwood, engineered wood flooring doesn’t need to be attached to a subfloor. It can be nailed or glued down like traditional hardwood, but installing it as a floating floor can be more budget- and beginner-friendly. Most varieties of engineered wood come in the form of tongue-and-groove planks that you can snap together like a jigsaw puzzle. It’s fairly straightforward and low risk, which makes it an ideal choice for anyone determined to DIY their new flooring. 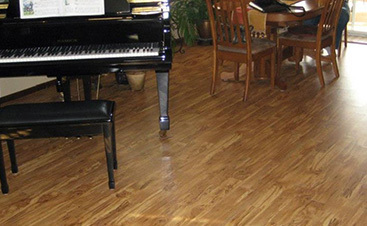 Vinyl is another forgiving flooring type you can choose to install on your own. Installing sheet vinyl is a relatively straightforward process, and as long as you follow instructions and take your time, the end product can be professional-grade. You may have to tackle the extra step of adding an underlayment, but there are plenty of resources online to help you through the process. Laminate is another flooring type that utilizes snap-together planks. Clean the subfloor, leave space for expansion, and click together your new flooring piece by piece. With the right directions and level of attention and care, it’s hard to go wrong. Hardwood floor installation is a significantly more involved process than what we discussed with other materials. There are stringent requirements pertaining to where you can install it and what materials you need, as well as prerequisite construction details that are better left to the pros. Solid hardwood needs to be nailed or stapled to a subfloor, and if you don’t have a subfloor, then one will have to be installed. For the best results, trust an expert team like the one at Gateway Design & Home. Installing carpet squares can be manageable for a beginner, but wall-to-wall flooring can get dicey if you don’t have much experience. Mistakes can lead to lumps and unsightly wrinkles. With a professional team, you can rest assured that your high standards are adhered to, and Gateway’s whole-home carpet installation services cost just $40. Gateway Design & Home is dedicated to pairing you with the perfect flooring for your next project, whether you want to do it yourself or outsource the installation process. To save yourself time, effort, and the possible cost of repairs or reinstallation, turn to our experts. Our in-house team is ready and waiting to tackle your next project, and with our help, you’ll be able to enjoy your gorgeous new flooring without dealing with the mess and exhaustion in between. Contact us today to schedule your flooring installation! Choosing new flooring for your home is a big decision, and the team here at Gateway Design and Home doesn’t take that lightly. We want to give you all the information you need to choose the perfect flooring for your tastes, your lifestyle, and your budget. Not only can you schedule a personalized consultation with one of our specialists at our Loveland showroom, but you can also learn more about your options here on our site! Explore our blog to learn the pros and cons of all the flooring varieties we offer, from hardwood flooring to carpet, and better understand materials you may never have considered, like laminate or engineered wood. If you have questions, you know where to go — the Gateway Design and Home team is here to help! Visit our Loveland showroom or call today for your one-on-one consultation! We look forward to working with you. Schedule Your Showroom Visit Today!